The other day a padded envelope arrived in the mail with my name on it. I still get a thrill when I get something like that – probably a holdover from the days of saving box tops to send in for prizes back when it took 6 to 8 weeks for delivery. The prize would arrive in a box or envelope out of the blue and the excitement of getting mail as a kid was a big deal. For those of you who don’t know, the US Military awards the Purple Heart medal to people who are wounded on the battlefield. To receive a Purple Heart means you were fighting for your country and have the scars to prove it. Sometimes, it is awarded posthumously. My battle has been not with an enemy at war but with a silent killer – one that is hard to eradicate because it refuses to fight fair by hiding until it’s too late. My only course of action is to keep working in support of research and finding a better way to treat it. That can be done by raising money. My Purple Heart (or PurpleStar) is a medal for fighting it even while taking the body blows and personal losses. My dad and sister are the real casualties. My wounds are survivable. The medal is a small tribute in the larger cause. I both love it and hate at the same time. 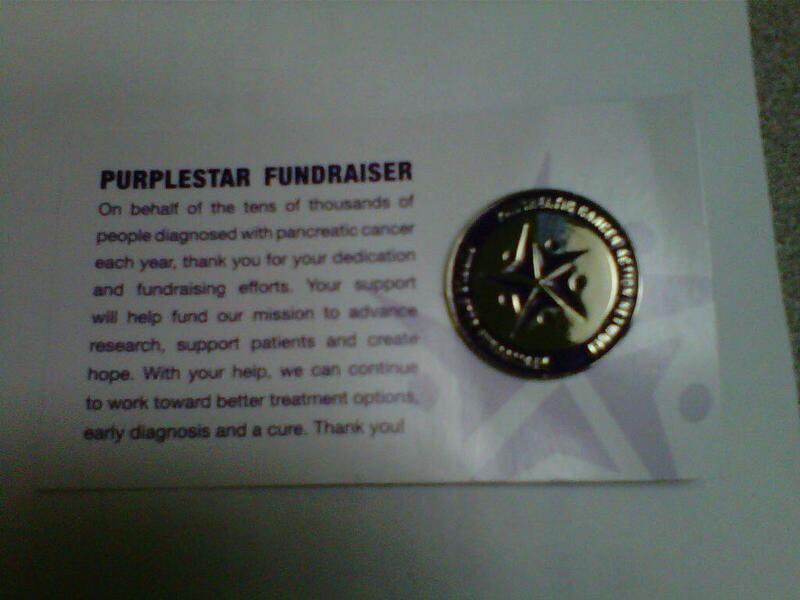 I wish I’d never heard of pancreatic cancer, but I have and so I will fight it however I can, wearing my PurpleStar as a badge of honor. This entry was posted in Cancer, General Rambling, Support and tagged PanCAN, Purple Heart, Purplestar, PurpleStride. Bookmark the permalink.